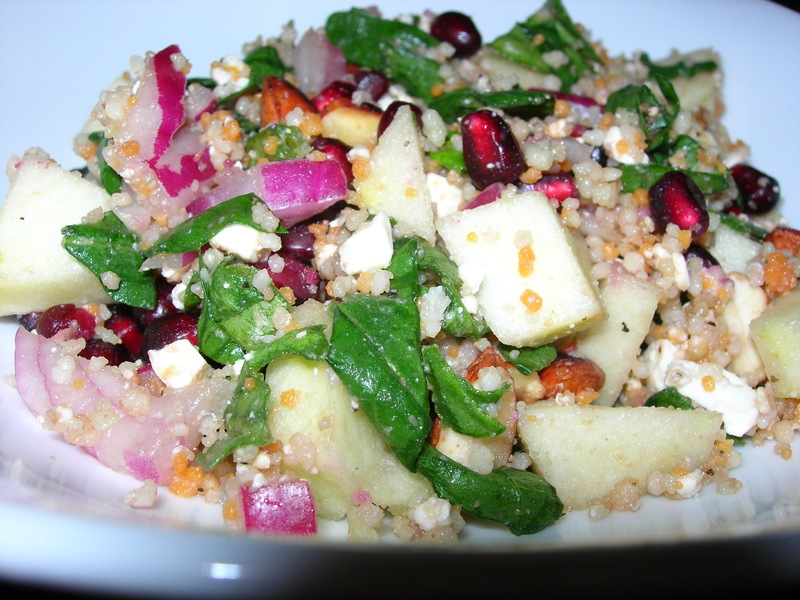 This was a delicious and easy salad for lunch. 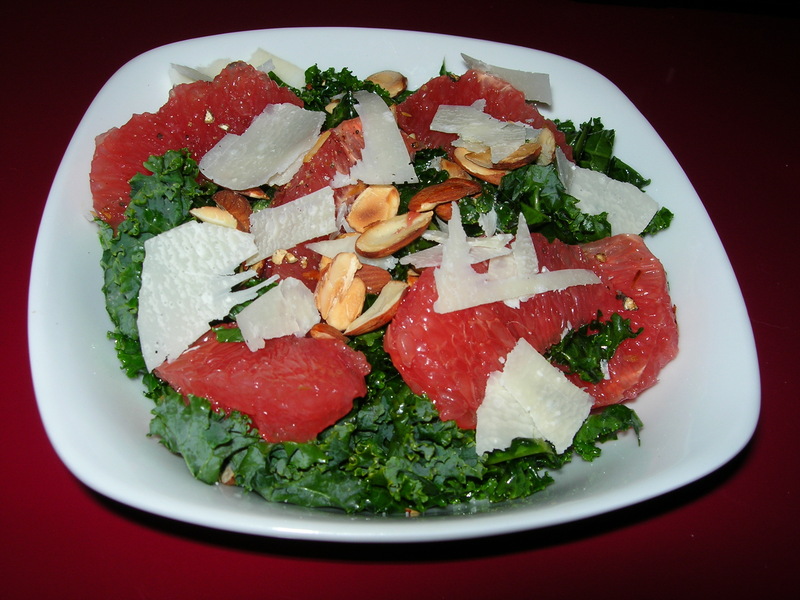 I started by making my dressing first, a grapefruit zest- infused balsamic vinegar and oil. I made it first because I wanted the zest to soak into the balsamic vinegar and enhance its flavor. First, zest the grapefruit until you have 2 TBSP of grapefruit zest. Add it in a small container that seals to 1/4 cup of balsamic vinegar. Let rest for 10 minutes or until you are done making your salad. Add 3 TBSP of olive oil, salt, and pepper. It makes enough for 3 salads, so you will want the container to seal so it can be saved. Put a dozen almonds in a dry pan on medium high heat so they toast. Keep an eye on them so they don’t turn too dark. You don’t want them to turn bitter. Using a vegetable peeler, slice thin strips off the asparagus so you have a nice deep bed of asparagus strips for the base of your salad. Cut the ends, the peel and the pith off the grapefruit and carefully remove the segments from the skin. Cut them in half, and toss on the asparagus. Cut your onion in half lengthwise. Take half and cut it in half again. Cut off both ends and slice thinly, separating the slices into thin strips. Toss into the salad. Chop the almonds and toss them on top. Shake the dressing to mix the file and vinegar and toss on the salad. Mix lightly and serve. If you want to add cheese, you could add thin strips of parmesan, but it really did not need it. 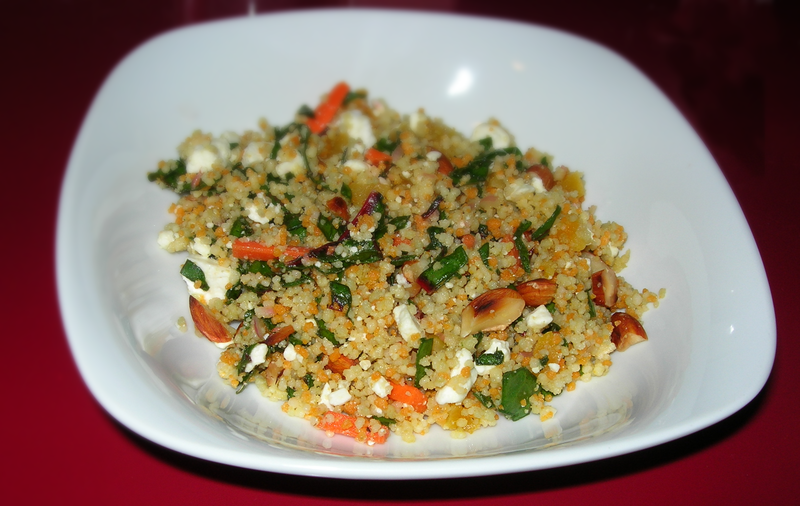 I thought it might be interesting to remake my favorite salad with Tajín instead of salt and pepper. It was a brilliant move, making an old and frequentI w favorite new again. I was set to make a fresh asparagus salad again when I recalled a friend’s recent Facebook post sharing 23 Things You’ll Definitely Find in Every Mexican Household. I don’t have all that many of the items, but I do have Tajín, a delicious spice blend of dried limes, Mexican chiles and sea salt. It’s delicious on fresh jicama sticks, grapefruit and watermelon. I thought it might work on this and it did. Wonderfully. I used 6 slender stalks of asparagus. Using a vegetable peeler, just peel and peel and peel of thin strips of the asparagus. This salad is actually easier with older, later in the season asparagus that is bigger around and less tender because it’s easier to peel. I go from the head to the root because that makes it a little easier. While I was slicing up the asparagus, I toasted a small handful of almonds. When they were toasted, I set them aside to cool, finishing the asparagus. I chopped up the almonds. Using the same vegetable peeler, I sliced off some asiago cheese and tossed on top of the salad. I then squeezed the juice of 1/2 a lemon on the salad and sprinkled the top of it with Tajín. I did not add salt and pepper like I usually do. 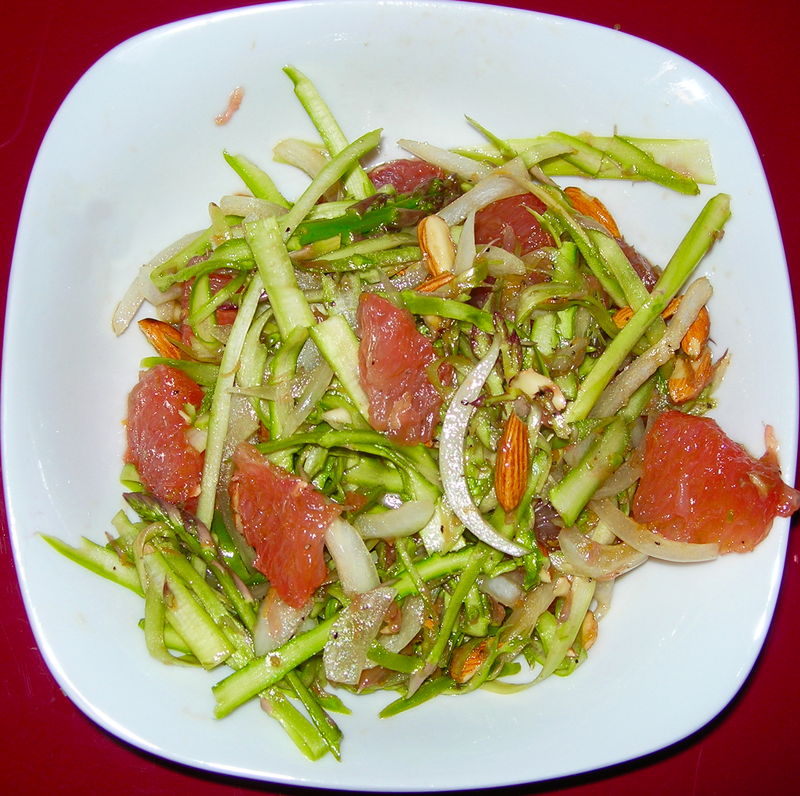 The salad was fresh and light with a tangy, spicy heat. Delicious! I never would have made this if not for you, Gloria! Thanks. I made some bulgur while I made my morning tea, adding two cups of boiling water to 1 cup of bulgur and leaving it io absorb the liquid. It was tender and ready for salad later in the day when I was making lunch. I started by cutting the flesh from a grapefruit. To supreme a grapefruit, cut away the peel and then slice the wedges. I cut this on cutting board to capture all the grapefruit juice that gets squeezed out in the process no matter how hard you try to avoid it. I cut the wedges to avoid any skin and pith and then tossed the juice on the cutting board and the skin and grapefruit left on the skin when cutting wedges into a sauce pan to flavor a vinaigrette. I added about 3 TBSP of chopped onions and cooked them with a bit of olive oil and the grapefruit remnants. I added about 2 tsp of sugar and some white wine vinegar. The vinaigrette was tart and sweet and delicious. I removed the grapefruit bits and left the onions. I added the grapefruit segments from the grapefruit plus thinly sliced pieces from two stalks of celery, about 1/4 cup of pomegranate, 2 cups of chopped spinach, 1 cup of chopped cilantro, 6 toasted and chopped almonds and 1/4 cup of feta. 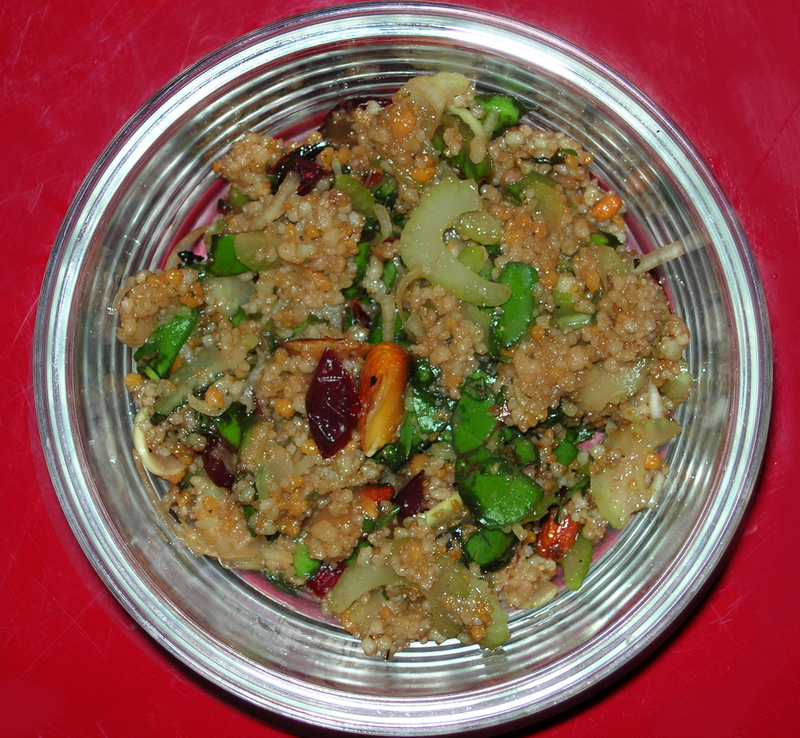 I then added the bulgur and the vinaigrette and let the flavors marry for about an hour before serving. 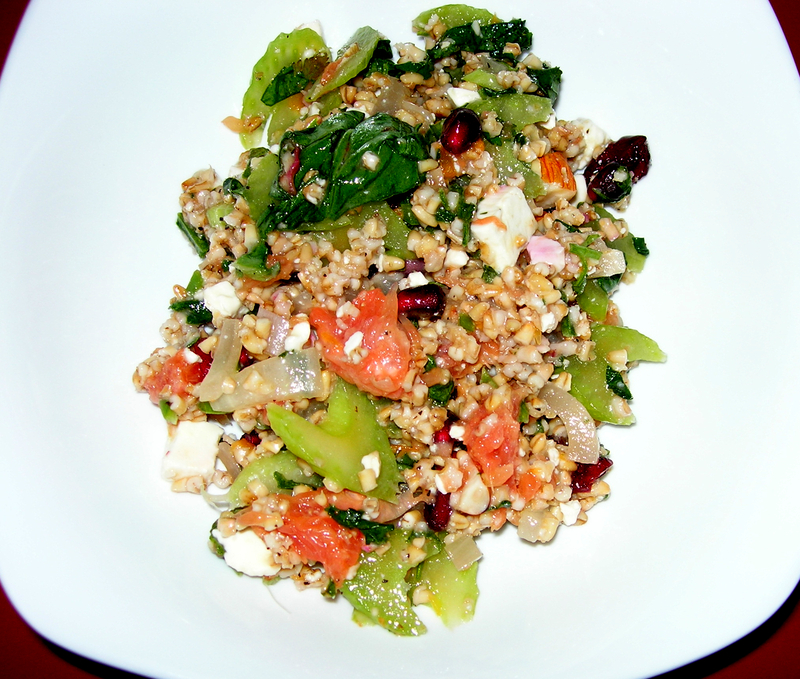 The bulgur have it a hearty foundation and the grapefruit and pomegranate added a nice light sourness. The vinaigrette was slightly sweet. The salad was a rich combination of flavors. 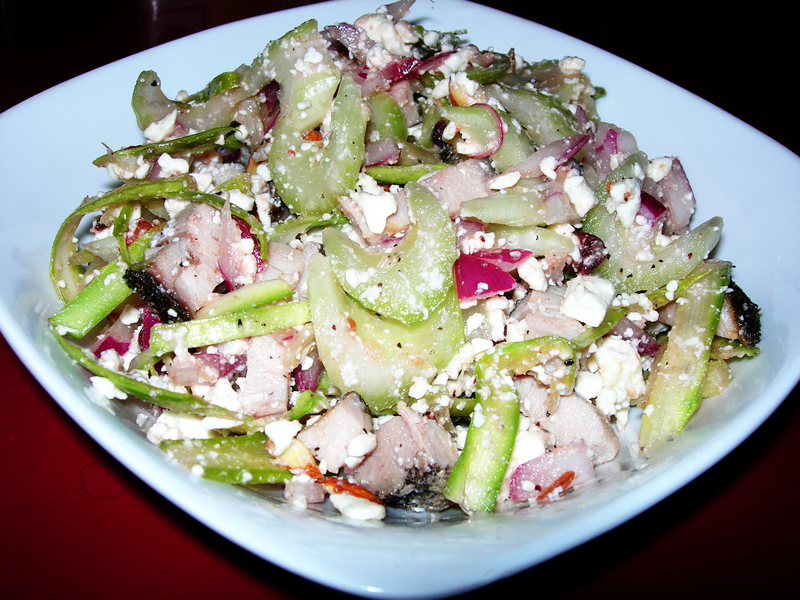 The next time I make it, though, I might try added some dried cherries, too. Makes 4 servings. Is there anything better than a big bunch of pea shoots in the spring? This one bunch has been enough for seven meals. Four salads, two meals of soup and I have some left for salad tomorrow. Yum! For today, I chopped up the tops of the pea shoots (I used all the bottoms in the soup yesterday) and scattered them on a plate. I put some almonds in a dry pan on high heat and let them toast while I prepared the rest of the salad. Then I peeled half a cucumber and after it was peeled, continued with the peeler to slice off thin slice after slice and scattered them on the pea shoots. Then I supremed one grapefruit and spread it around the outside. I chopped the toasted almonds and tossed them on top. Adding some salt and pepper, I sprinkled some balsamic vinegar on top as well as a bit of walnut oil and served. 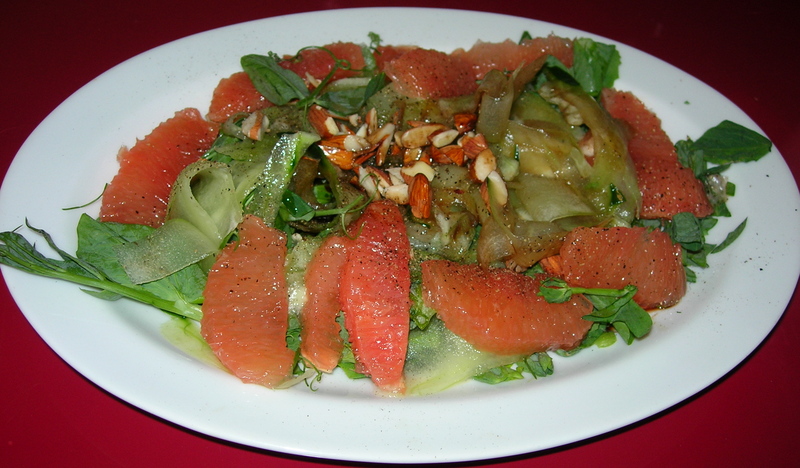 I love the mix of hearty toasted almonds, the light cucumber, the tangy sweet grapefruit and the hearty pea shoots all harmonized by the balsamic vinegar and oil. It was a delicious and light supper for a hot day.